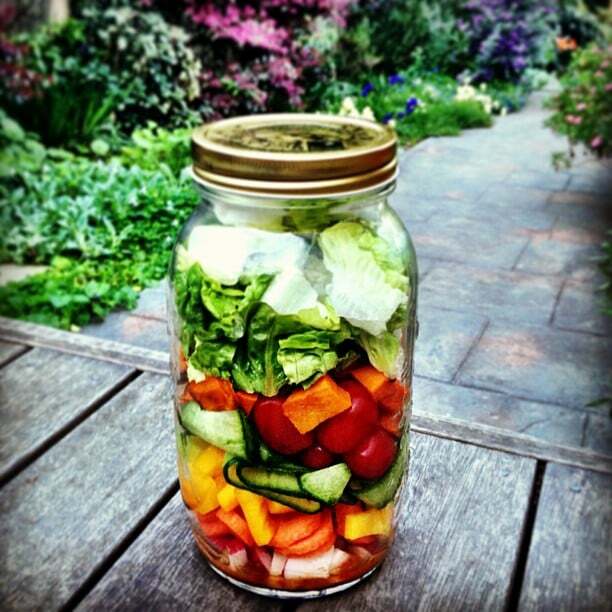 Have you hopped on the #saladinajar craze yet? 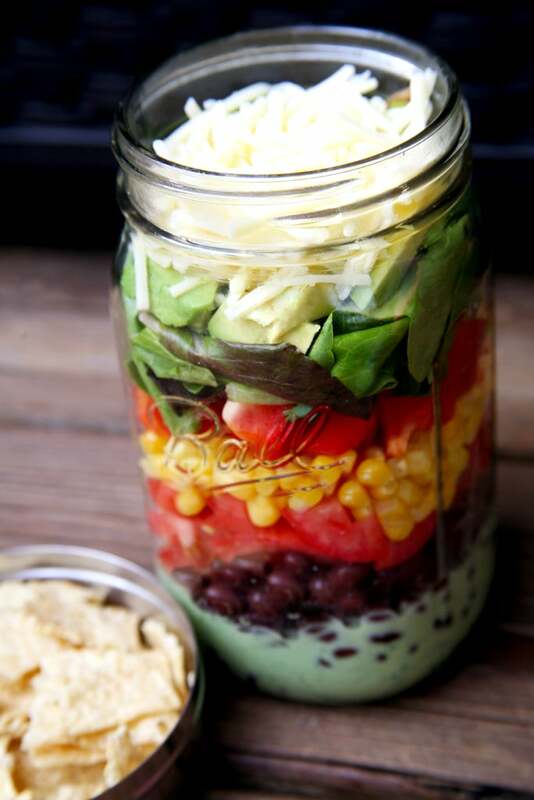 Not only do these colorful layers look enticing, but with a little prep, you can whip up an entire week's worth, all at once. 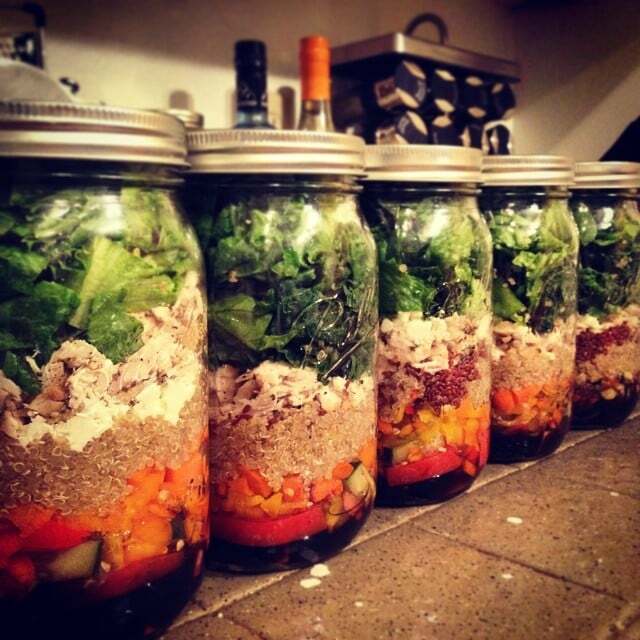 Buy some mason jars and get ready to be inspired. Have fun at the farmers market and pick up some colorful foods like blueberries, yellow peppers, and cucumbers. 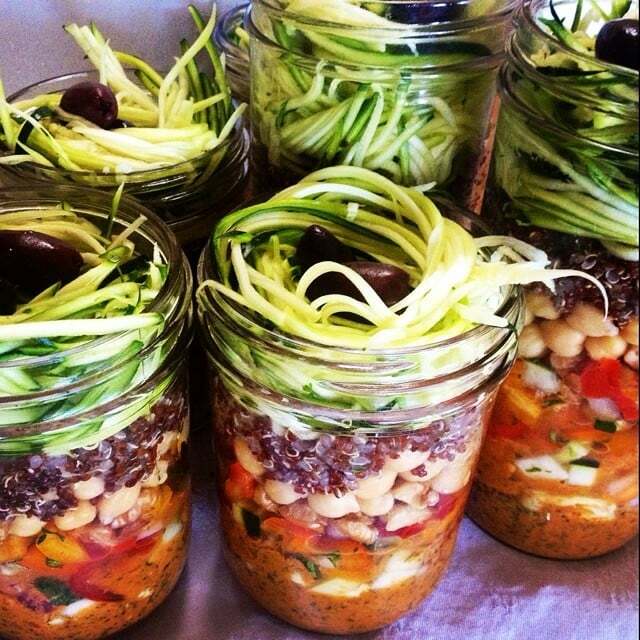 Pour gingery dressing on the bottom, add chickpeas, and then layer all the colors of the rainbow. 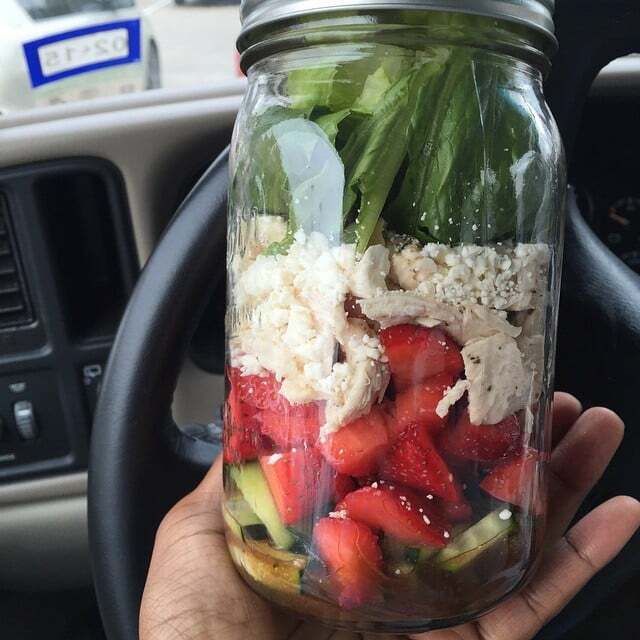 Top with extra protein like tofu or grilled chicken and sunflower seeds, and you've got the perfect jar of salad happiness. Don't limit salad to just greens! 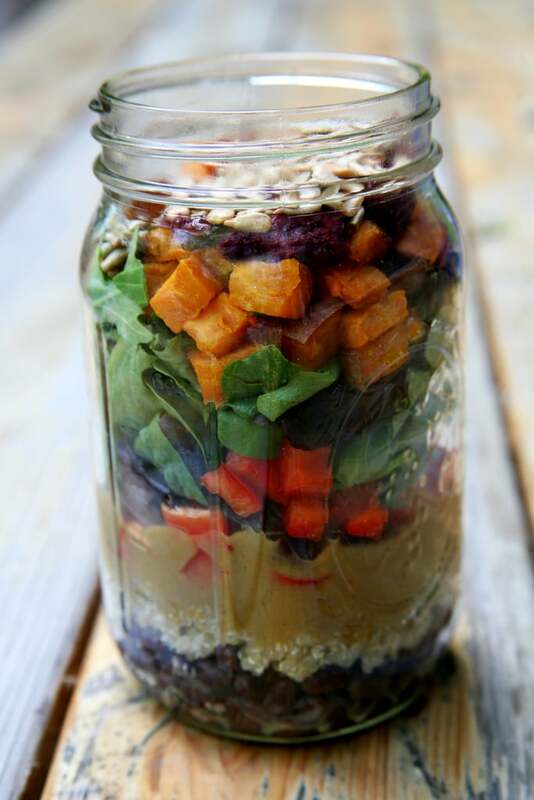 This salad includes roasted sweet potatoes and cooked quinoa to make your meal extra fiberlicious and filling. 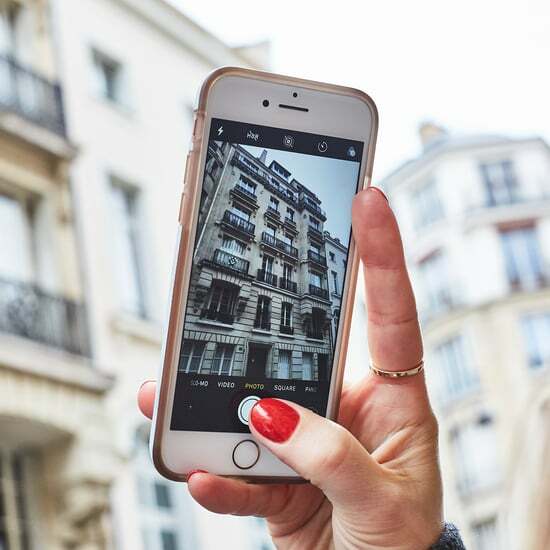 You'll stay satisfied longer, which means no need to reach for more calories later in the day. The homemade mango vinaigrette is so sweet, you won't even need dessert afterward. The homemade cilantro-lime dressing gives this vegetarian taco salad a fresh and zesty flavor perfect for the warmer weather. And for just over 450 calories, it offers almost 25 grams of both protein and fiber. This grilled beet and chicken salad contains 34 grams of protein and almost nine grams of fiber, making it filling enough to keep you satisfied for hours. All it takes is a little prep on the grill, and consider tomorrow's lunch made. 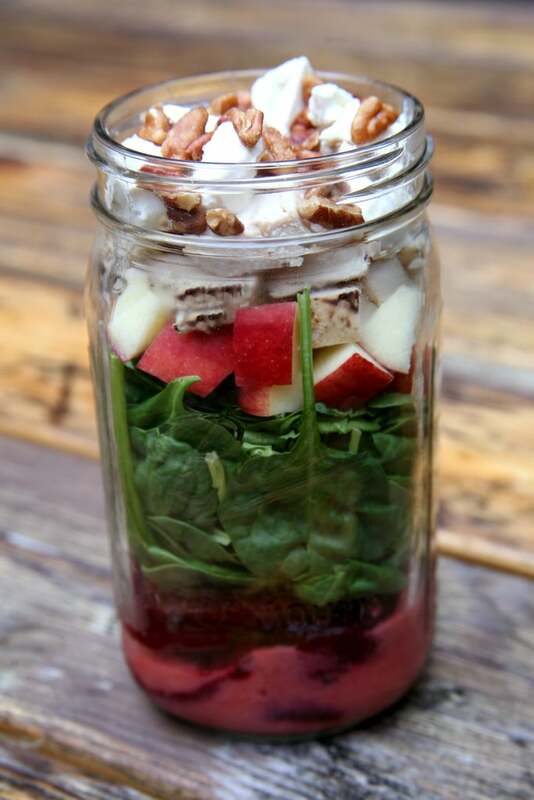 Ah, the taste of Summer in a jar. 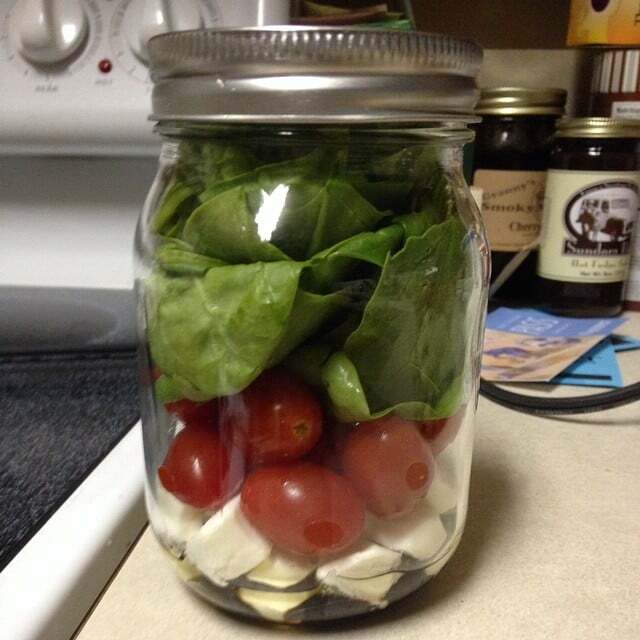 Balsamic vinegar, fresh mozzarella, cherry tomatoes, and freshly picked basil. Yum! Make this low-cal chicken salad or this chickpea salad if you're vegetarian. 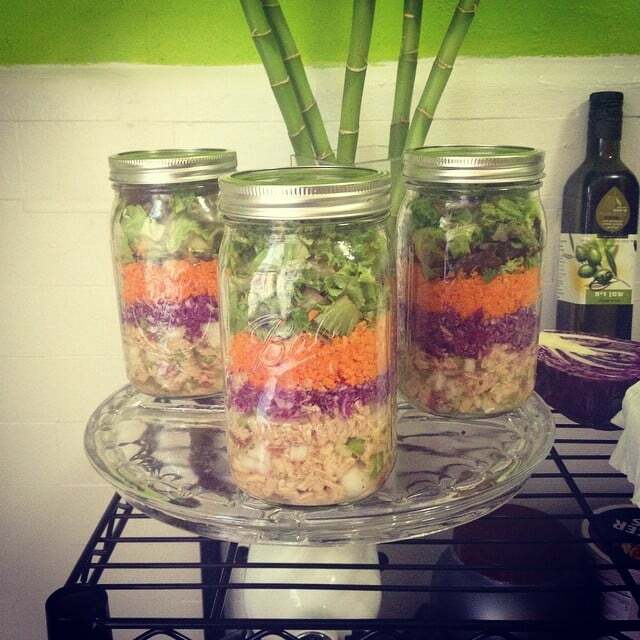 Add it to the bottom of your jar and top with shredded red cabbage, carrots, and greens for a high-protein lunch. 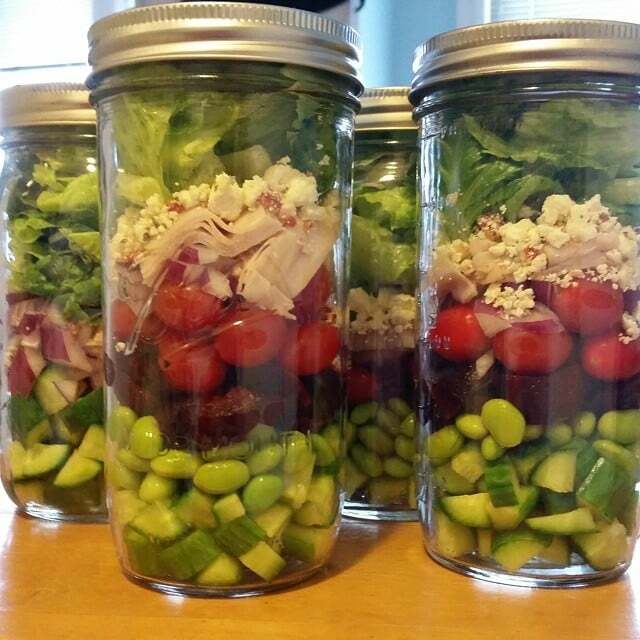 This jar is layered with fresh garden cucumbers, shelled edamame for protein, beets, cherry tomatoes, red onion, sliced turkey, feta, and romaine. 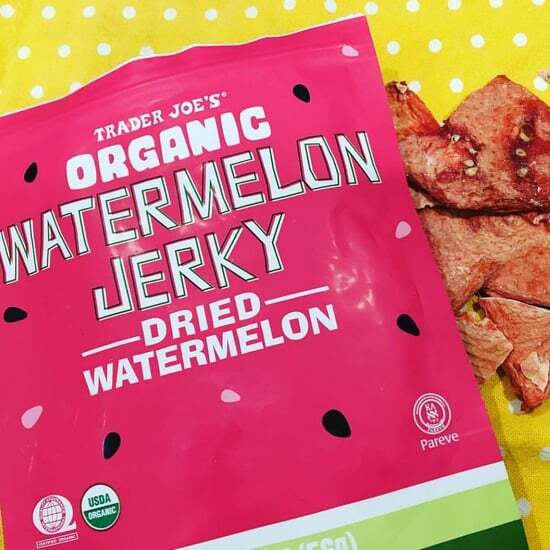 Crunchy and satisfying! 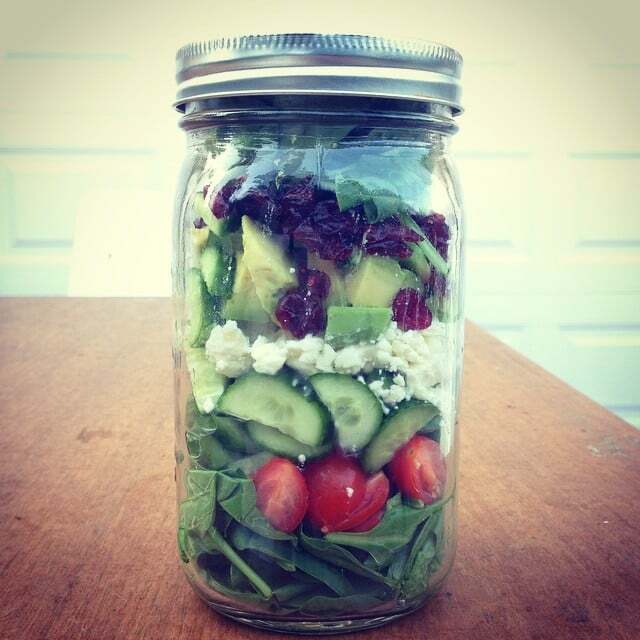 This jar is filled with spinach, tomatoes, cucumbers, goat cheese, avocado, dried cranberries for sweetness, and then even more spinach! 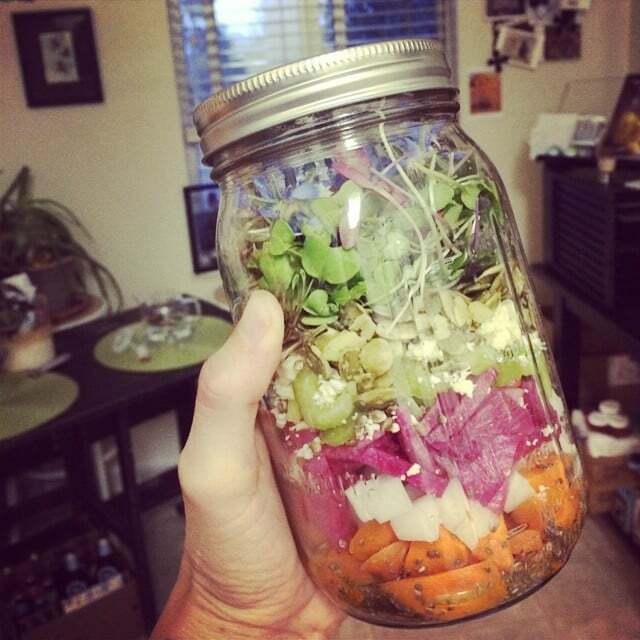 White, purple, and yellow cauliflower steal the show in this mason-jar salad. Add bites of raw carrot, cucumber, pinto beans, mushrooms, raisins, and greens, and this chunky salad is appealing to the eyes as well as the tummy. Aside from the usual cucumbers, carrots, and red bell peppers, this salad features cooked quinoa, whole flaxseed, and kale to increase the fiber that will keep you feeling full for hours. 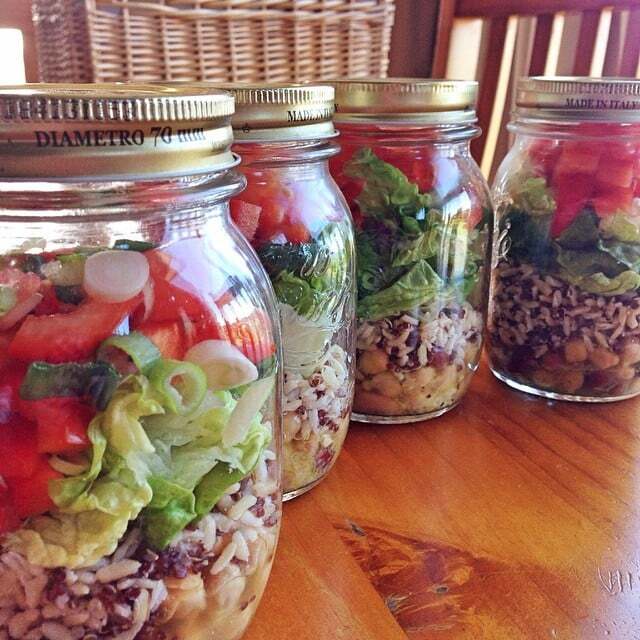 Mason-jar salads don't have to just be about veggies. 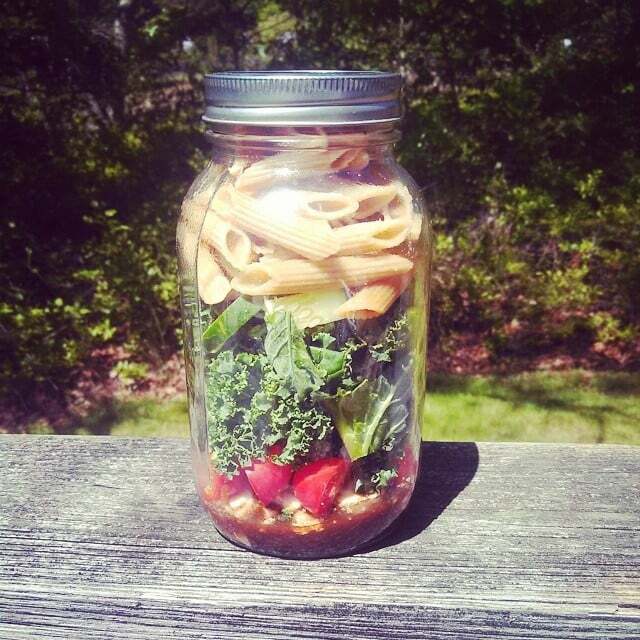 This one is filled with balsamic vinaigrette, mozzarella, tomatoes, kale, and whole-wheat pasta. 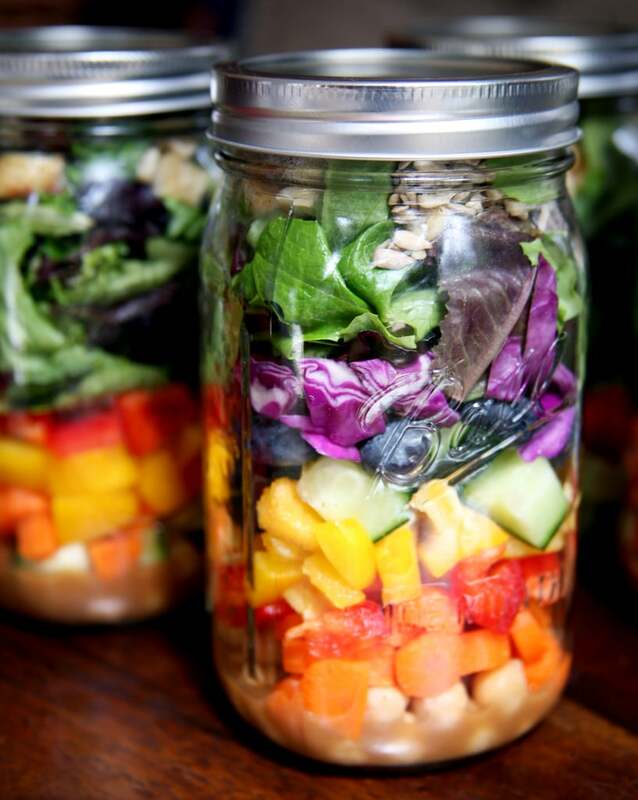 Fruit adds sweet juiciness to a boring jar of veggies. 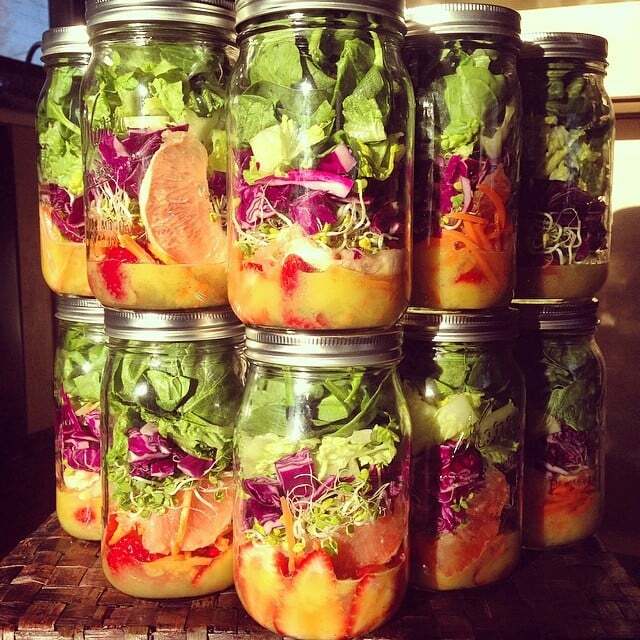 This salad is made with homemade mango vinaigrette, strawberries, grapefruit, carrots, radish sprouts, red cabbage, and two kinds of lettuce — romaine and spinach. 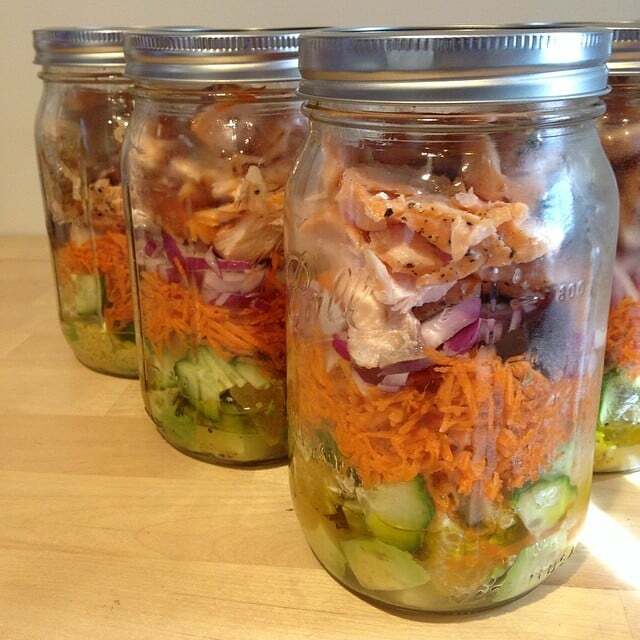 For a protein punch, this mason-jar salad is made with wild salmon, as well as beets, red onion, carrots, cucumber, orange, and avocado. Get your hands on a spiralizer and make noodles out of raw zucchini for this salad. 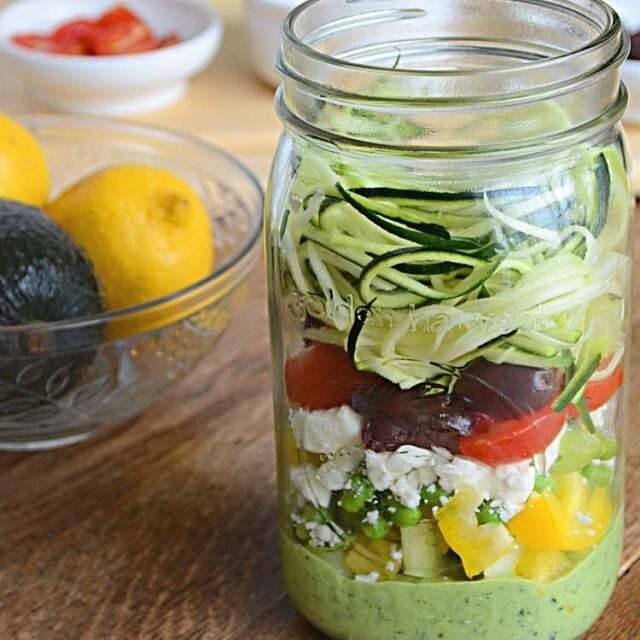 The dressing is made with avocado and spinach, which tastes so fresh with yellow peppers, peas, tomatoes, black olives, and feta. 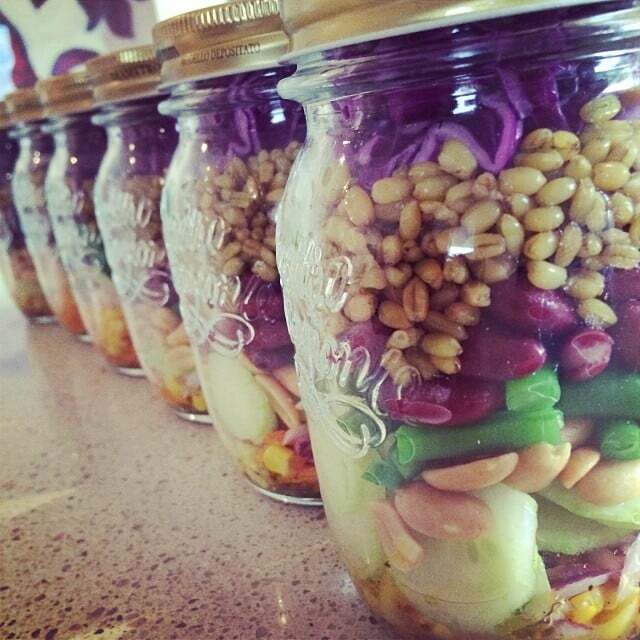 This colorful jar looks almost too fun to eat. 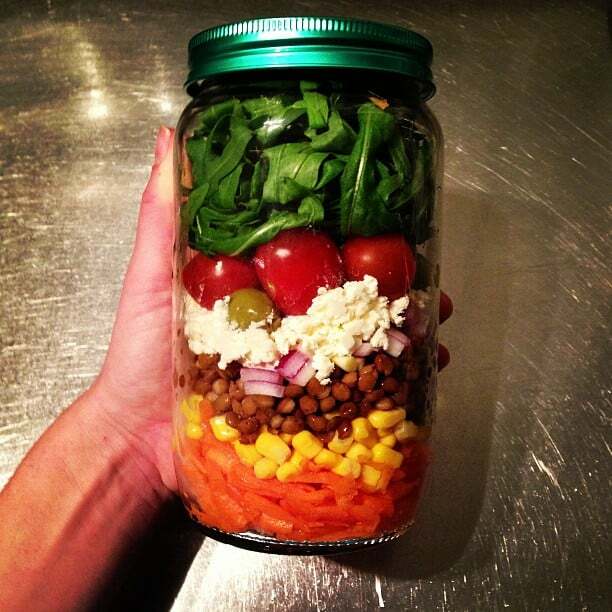 Shredded carrots, corn, lentils for protein and fiber, cheese, olives, tomatoes, and spicy arugula will beat boredom any day of the week. Spice up your regular salad routine with roasted pumpkin and cucumber ribbons. Hydrating watermelon adds a subtle sweetness to this salad made with carrots, daikon, celery, feta, pumpkin and hemp seeds, mixed sprouts, basil, and edible flowers. 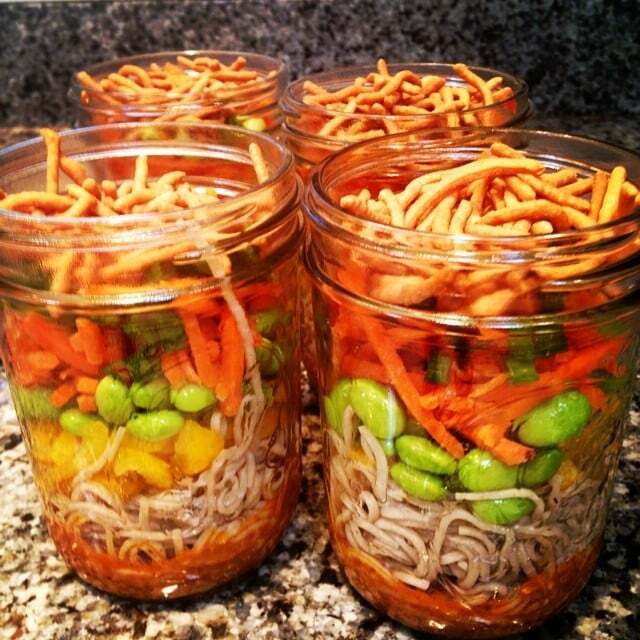 If you're craving Chinese food, enjoy this salad made with lo mein or udon noodles, shelled edamame, shredded carrots, green onions, and topped with crispy fried noodles. 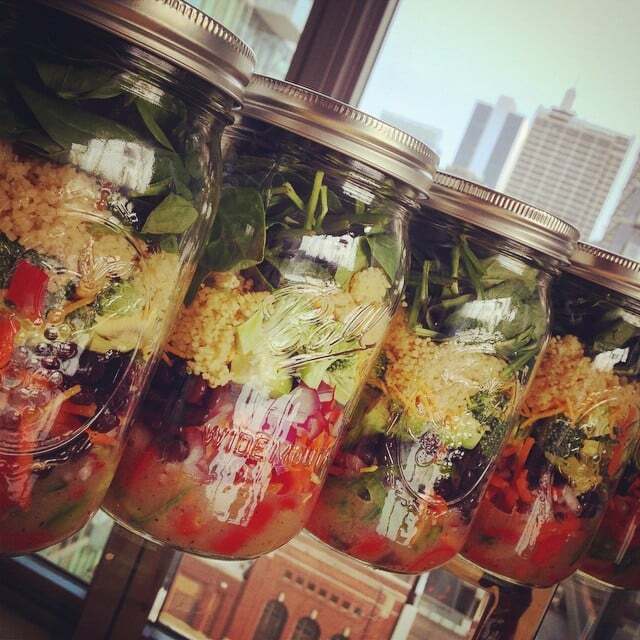 Sun-dried tomato pesto, roasted red pepper, and tahini lemon dressing taste amazing with artichoke hearts, toasted walnuts, red, yellow, and orange bell peppers, parsley, cucumber, cherry tomatoes, garbanzo beans, cooked red quinoa, zucchini noodles, and Kalamata olives. This salad is bursting with Mediterranean-Italian flavor. Quinoa isn't the only cooked grain that tastes great with veggies. This salad is made with barley, as well as kidney beans, green beans, and peanuts — all excellent vegetarian sources of fiber and protein. 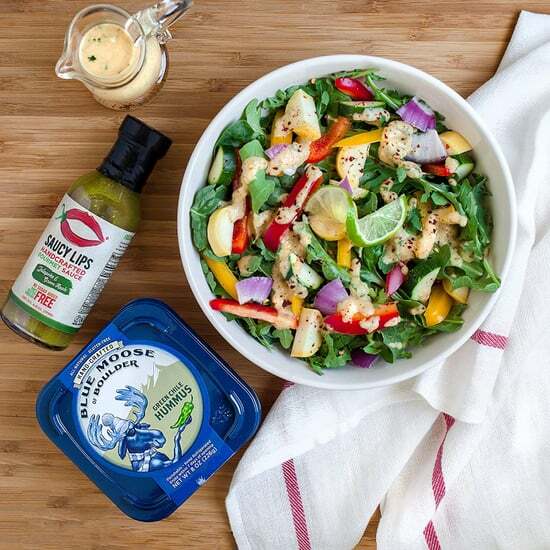 Adding a little pop of bright color to your green salad can make it look and taste more appetizing. 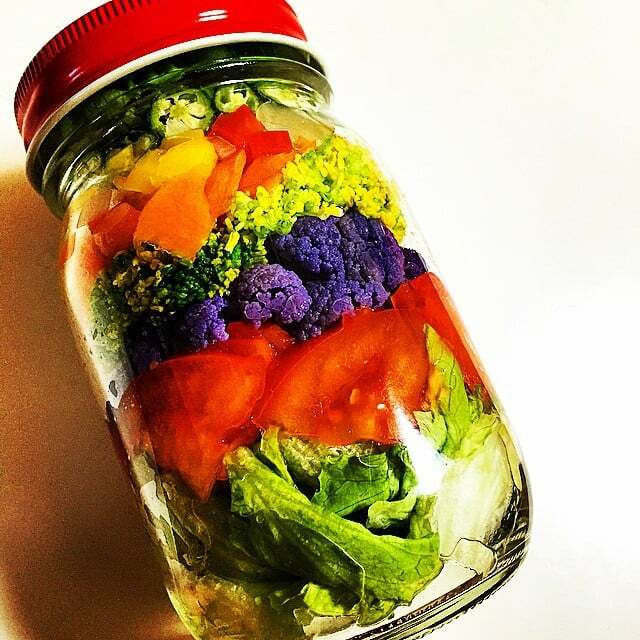 Try purple cauliflower instead of white, yellow peppers instead of green, or yellow tomatoes instead of the usual red. 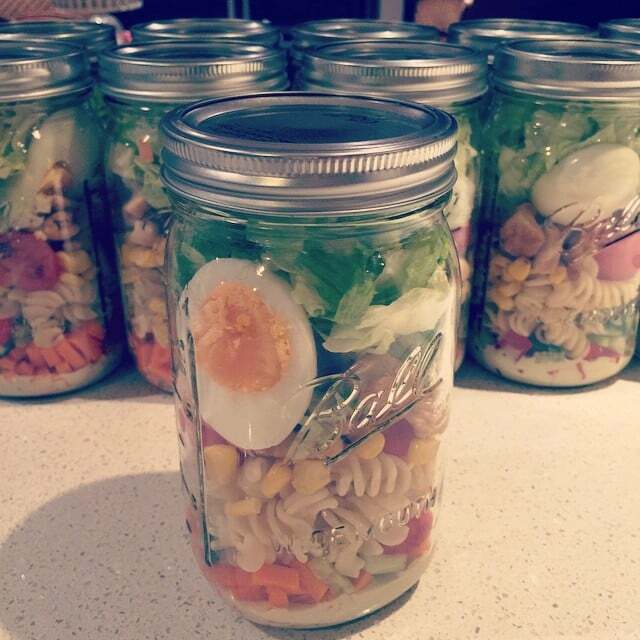 To keep hunger at bay all afternoon, boil some eggs and add those to your salad for an easy source of protein. Cook quinoa and rice together, pair it with garbanzo beans, and these salads are easily packed with complete proteins that are sure to fill you up. 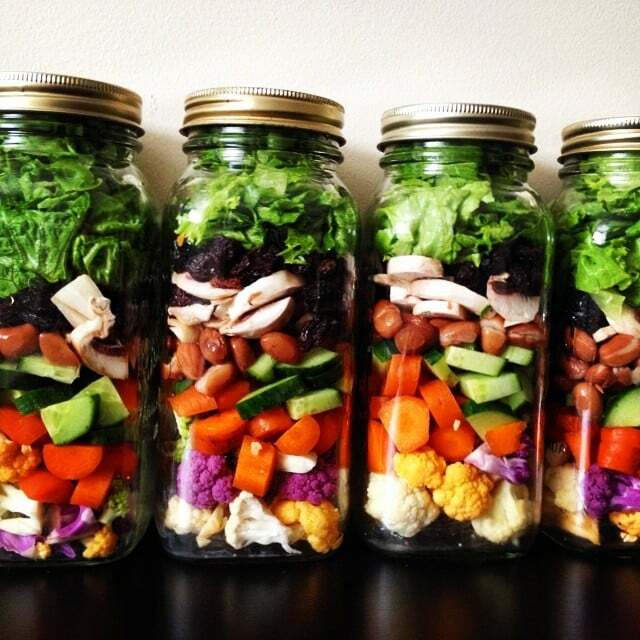 There's no need to spend a lot of time making your week of salads. 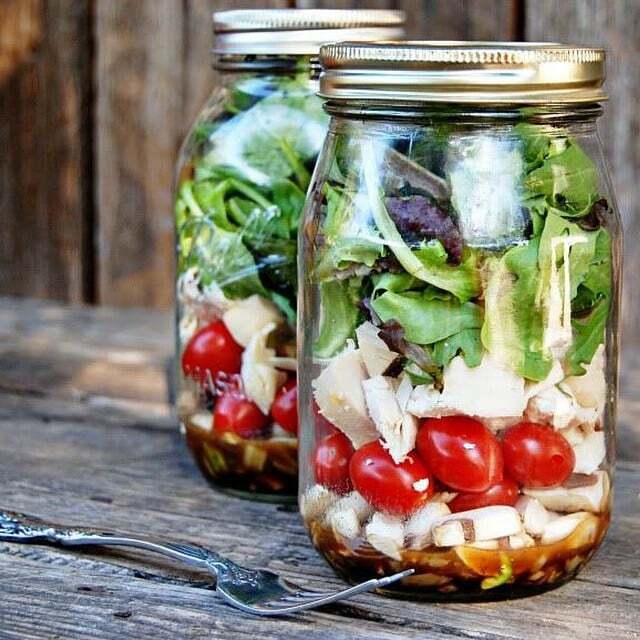 These only contain five ingredients — balsamic vinaigrette, mushrooms, cherry tomatoes, roasted chicken, and greens. This salty-sweet salad combines diced strawberries, crumbly feta cheese, baked chicken, cucumbers, and romaine lettuce.